April 12 is National Licorice Day, which is a great excuse to snack on everyone's favorite movie theater candy. But what licorice will it be: Twizzlers or Red Vines? April 12 is National Licorice Day, which is a great excuse to snack on everyone's favorite movie theater candy — or fifth, sixth or 26th favorite, depending on who you ask. But what licorice will it be: Twizzlers or Red Vines? There are countless Reddit threads, taste tests on YouTube, and food articles written about the Red Vines vs. Twizzlers debate. Just look at Delish's "9 Reasons Red Vines Are Better Than Twizzlers" and Food Beast's "Why Twizzlers Are — And Always Will Be — Better Than Red Vines." Everyone has an opinion, and everyone thinks they are absolutely on the correct side of the debate. So which are better? Obviously, it comes down to preference, but there are at least a few quantifiable (and just sort of quantifiable) ways to look at this debate. According to its website, Red Vines have been around since 1914. 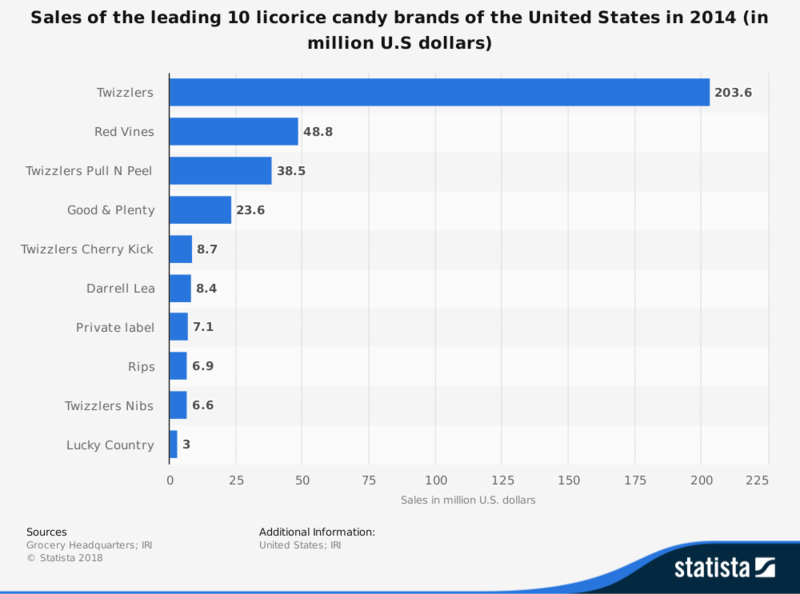 The brand is owned by American Licorice Company, which also makes Sour Punch candies. "The unique taste and texture of Red Vines has a lot to do with why it’s been around for several generations," said Clint Christensen, brand manager with Red Vines. "Red Vines truly is a timeless piece of candy because it is made with the same batch process that the founders of our company used over 100 years ago." Twizzlers, on the other hand, claims to have been thought up in 1845. A "not-so-serious-ey" timeline on its website offers few details on the actual origins. The next milestone it claims is Neil Armstrong requesting Twizzlers on the moon in 1969. In reality, the Young & Smylie Confectionery Company, later Y&S Candies, was founded in 1845 and established the Twizzlers brand in 1929, although it was producing licorice before that. The company and Twizzlers was acquired by Hershey, which makes Reese's, KitKats, Jolly Ranchers and many other candies, in 1977. Sorry, Red Vines fans. There's really not a contest on this one. Consumers bought almost four times as many traditional Twizzlers as Red Vines in 2014. Whether you care about what's in your candy is an individual preference, but there's no denying the list of Twizzlers ingredients is longer than the one belonging to Red Vines. "While sugar is sugar is sugar, something about the shorter list of ingredients with shorter names makes me feel slightly better about consuming Red Vines," Clair Robins with online candy retailer CandyStore.com said. Red Vines Original Red Licorice Twists: Corn Syrup, Wheat Flour, Molasses, Caramel Coloring, Licorice Extract, Citric Acid, Artificial Flavor, Anise Flavor, Red 40. Twizzlers Strawberry Twists: Corn Syrup, Enriched Wheat Flour, (Flour, Niacin, Ferrous Sulfate, Thiamin Mononitrate, Riboflavin, and Folic Acid), Sugar, Cornstarch, Contains 2% Or Less Of Palm Oil, Salt, Artificial Flavor, Mono and Diglycerides, Citric Acid, Potassium Sorbate, Red 40, Mineral Oil, Lecithin, and Glycerin. So who wins? Let's give this to Red Vines with more followers on two out of the three major social platforms. Red Vines has 14 different varieties of licorice on its website, including twists, ropes, bites, bars and twistettes. The brand announced a 15th option at this year's Sweets and Snacks Expo. It's adding Made Simply Cherry, which will be non-GMO, naturally flavored and colored, and made with real sugar. Plans are to have it available in stores in November. Twizzlers website currently offers 17 different varieties, including several flavors of twists, bites and pull 'n' peel and nibs. Its last new product announcement came in 2017 with the limited-time release of its "Flavors of America" line that included Key Lime Pie and Orange Cream Pop flavored items inspired by Florida.